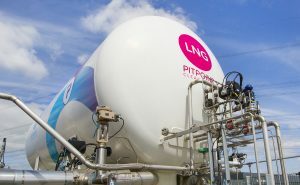 PitPoint.LNG will build Germany’s first liquefied natural gas (LNG) bunkering station in the harbor of Cologne. The new station will facilitate the bunkering of LNG powered inland waterways vessels that sail on Europe’s busiest transport waterway, the Rhine. The construction of the bunkering station is a next step in PitPoint.LNG’s strategy to develop a European LNG infrastructure to facilitate the uptake of LNG as fuel for road and marine transport. LNG is considered as one of the most promising alternative fuels for the transition towards cleaner transport by shipping. LNG combustion is cleaner than diesel combustion, improves the local air quality (less health damage caused by particulate matter/soot or NOx) and reduces CO2 emission. LNG powered vessels help ship owners and operators meet emission standards set for shipping without requiring additional exhaust after treatment systems. As a system integrator, PitPoint.LNG designs, builds, finances, maintains, and operates LNG refueling infrastructures, making LNG affordable and available. The realization of LNG bunkering stations falls within PitPoint.LNG’s strategic objective to develop an LNG infrastructure for trucks and shipping. This LNG bunkering station will be the first shore-to-ship LNG bunkering station of Germany and the first one to serve the busiest transport waterway of Europe (Rhine). Within Europe, Rhine countries account for 84% of goods transport on inland waterway. PitPoint.LNG is a joint venture formed by PitPoint clean fuels and Primagaz Nederland BV. PitPoint.LNG focus entirely on the realization and exploitation of a LNG infrastructure for the automotive and marine market. 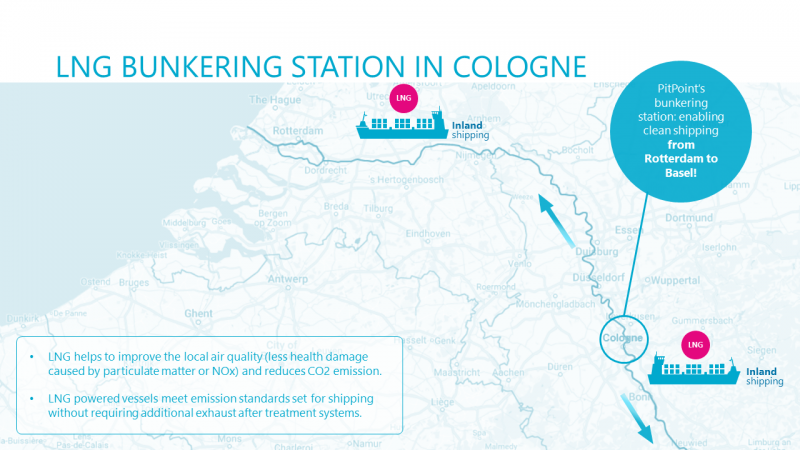 The bunker station is part of the project ‘Breakthrough LNG deployment in Inland Waterway Transport’ and co-financed by the Connecting Europe Facility of the European Union. The project supports the large-scale adoption of LNG as a transport fuel in the sector. For more information about the project, see our website. The sole responsibility of this publication lies with the author. The European Union is not responsible for any use that may be made of the information contained therein.